Released in Hong Kong is the compilation CD entitled "The Very Best Of Elvis Presley & the Beatles" featuring 16 songs by Elvis and 12 from The Beatles. Titles inluded are "Get Back", "Something", "Yesterday", "Lady Madonna", "Hey Jude", "Jailhouse Rock", "Hound Dog", "Don't Be Cruel", "One Night", "The Wonder Of You", "In The Ghetto" and more. besides copying and pasting the wonder of you and in the getto I'm really curious why they've chosen to mostly choose 50's material.. I've never heard of a lounge holding 2000 people before. In any case, just because the shows went downhill from '73, this still does not make Elvis a lounge act; that is an absolute and utter insult. Also, while I will tend to agree that the music also suffered in this period, to call him a "musical irrelevance" is taking it too far. If you really hate Elvis that much, join the Tom Jones Fan club instead. Lounge act - fact! Especially after '72 - a musical irrelevance. What a waste. What a damn shame. A lounge act? What an insult. Lounge act my arse, you've read too many Goldman books matey. As for the CD, it's just another crappy bootleg. Yawn. Funny you mention dino and sinatra,he would only a few years later become a lounge act himself,a strange place for the king of rock & roll! Yes i agree,he had the talent,did they just tell everyone,hey dont send us any material thats any good,my boy is only recording throw away movie stuff now,surely the same good song writers were willing to give him material,did they chase them off,my goodness how did it get to the point of films such as harum scarum! Mature - Elvis should have said you know what to the Tickle Me & Harum Scarum brigade and gone into the studio in 1965 and cut a killer album with the best musicians. Especially after The Beatles visited him that summer. That should have inspired him to get back into it. Lets face it, he was becoming less cool than Sinatra & Dino by 1966. At least in my high school. Elvis could have and would have been battling the beatles on the charts in the 60's.but you can''t battle anyone with nothing but throw away movie songs ,not to mention pathetic marketing by your label when a decent movie song did snaek in or non movie song also! I was going to make a positive comment even though I am not a big Beatle fan. And I am sure others have points, pro & con, to make. However, Steve has already labeled our intentions. These are all great songs which make for a fine CD for a person who wants to start out collecting either artist. Much better than the Camdens & the duets CDs. 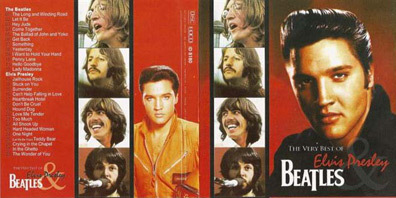 The Beatles are the only artists with a legacy than can share a CD with Elvis and here we have the 2 biggest recording artists of all time on one CD. Any negative comments from Elvis or Beatles fans are due to jealousy and narrow-mindness. Oh, the depths to which the Elvis catalogue has sunk. Nostradamus said: "Some sweet day, everyone without any taste about music will eventually own an Elvis Presley album". Wonder if this album will contribute to that prophecy..